One of the delights of my teaching career has been to see one of my sons become a piano teacher too. 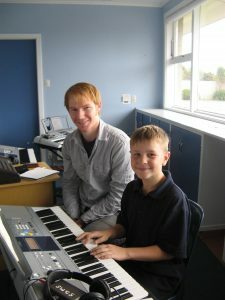 Isaac joined the team at Shirley District Music School, where I am currently the director, as a piano tutor. He was studying at the Christchurch Jazz School at the time and a year later completed his degree there in Jazz Piano. Isaac started learning piano with me when he was aged 4. We lived overseas at the time and my mother, a qualified Suzuki teacher, helped us both with his lessons at a distance from New Zealand. Besides Isaac, and siblings Fraser and Esther, I started teaching a number of other children and their mothers in the expat community we lived in. So I was both teacher and mum. It was a great experience for us all seeing the children progress with their music. A few years later I was approached by other expat mums asking if I would teach their children too. By this stage I was busy with some ethnomusicology projects and not free to teach piano, but I asked if they would like lessons for a lower fee from my sons, under my oversight. Fraser was about 16 and Isaac about 13. This worked really well as a win all round. I remember hearing Isaac say to one of his pupils one day “Now if you play it slowly you’ll get it.” Amazing to hear that from a boy who generally only had one speed for everything – fast! Teaching someone else helped him establish what he had been taught but still needed to work at too. It may come as no surprise that I put my first pupil for an exam when I was 15, under the careful tutelage of my mother, and have been teaching ever since. Some people think you can’t teach your own children. There are challenges – which we should talk about. So I’d love to hear from other parents who have taught their own children the piano.